This spring, Hellboy is back! The big red guy has a new movie (opening on April 12), a new director and a new actor taking on the role of a half-demon monster hunter. From director Neil Marshall (“Game of Thrones”) comes HELLBOY, starring “Stranger Things” favorite David Harbour as the title character. 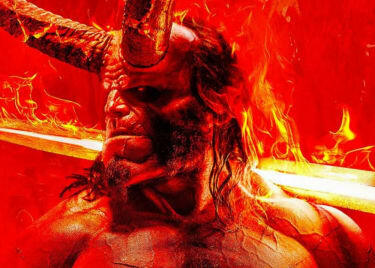 Even though the upcoming comic book flick has nothing to do with the two previous movies directed by Guillermo del Toro, Hellboy is still the badass demon we all know and love — this time with an R rating. And with the new movie comes a new story — and some new villains. Before HELLBOY hits theatres in April, take a moment to get to know the new, big bad guys the big red guy is up against. Let’s talk specifics. 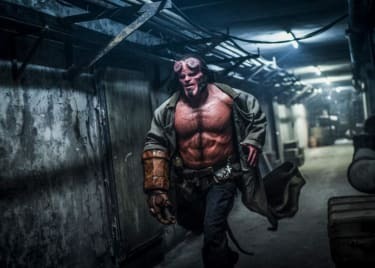 David Harbour’s character, Hellboy, is a specific type of demon known as a “cambion” — the offspring of a demon and a human. (Notably, Merlin was also a cambion.) Hellboy works for a top-secret government organization known as the Bureau for Paranormal Research and Defense, or the B.P.R.D. for short. The B.P.R.D. was founded by Trevor Bruttenholm, who adopted Hellboy when he was just a tiny Hell-baby. Played by Ian McShane of JOHN WICK, this version of Bruttenholm (above) is a little more rough around the edges than the one played by the late John Hurt in previous movies. He isn’t too pleased with his adopted son, as Hellboy tries to figure out his place in society. The B.P.R.D. team includes Ben Daimio (“Lost” star Daniel Dae Kim), a Japanese-American military vet with the supernatural ability to transform into a jaguar when he’s enraged. There’s also Alice Monaghan (Sasha Lane), a young woman with Irish heritage who was kidnapped by fairies when she was a baby. Ever since then, Alice has developed some interesting magical powers. In his latest cinematic adventure, Hellboy faces his most formidable threat yet: the ancient witch Nimue, played by Milla Jovovich of RESIDENT EVIL fame. Nimue — aka the Blood Queen — is a centuries-old medieval sorceress who has just one goal, and you can probably guess what it is. She wants to destroy the world. In medieval literature, Nimue is also known as “the Lady of the Lake,” a powerful enchantress who plays a crucial role in numerous stories about King Arthur and the Knights of the Round Table. In the “Hellboy” comics, Merlin gives Nimue immense powers that drive her insane, turning her into an evil sorceress. She’s resurrected in the modern day and adopts the persona of the legendary Irish war witch known as the Morrigan. Soon, she begins to gather an army so she can destroy humankind. That version of the villain inspired Jovovich’s character in the movie, which also features British actor Stephen Graham (“Boardwalk Empire”) as the voice of the monstrous Gruagach. He’s a mystical warthog that serves as Nimue’s right-hand man, er, warthog. While Graham voices Gruagach, the character’s movement is provided by motion-capture performance by actor and stuntman Douglas Tait. Several other characters are caught in the midst of this epic battle. One is the legendary wizard Merlin, played by Irish actor Brian Gleeson (LOGAN LUCKY). Thomas Haden Church of SIDEWAYS plays Lobster Johnson, a hot-headed vigilante who, in the comics (above), kills mobsters and brands their foreheads with his trademark symbol: a lobster claw. So that’s … odd. Australian actress Penelope Mitchell (“Hemlock Grove”) plays Ganeida, a sort of good witch to Nimue’s bad witch. Ganeida is desperate to stop the Blood Queen before she destroys the world. Complicating matters even further is Hellboy’s ongoing struggle to figure out where a demon like him belongs in the world of man — or if he belongs at all. He and Nimue share a certain bond, which could be trouble for the rest of us. 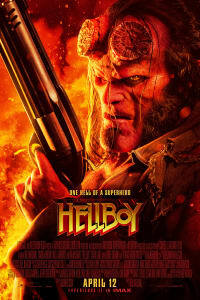 HELLBOY comes to AMC on April 12.